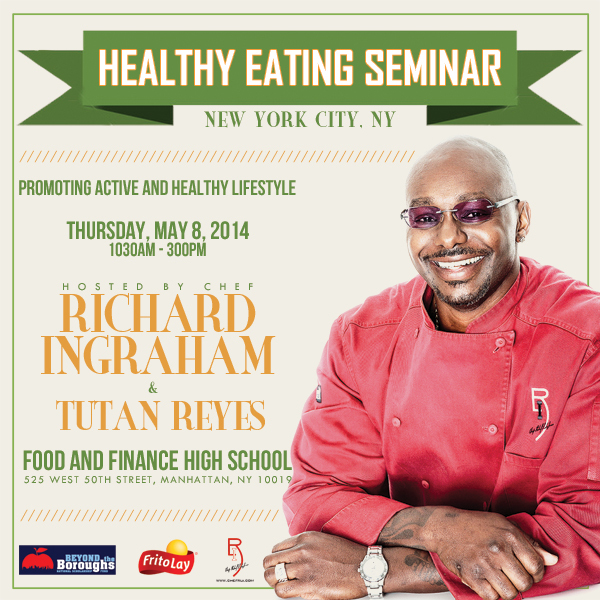 On Thursday, May 8, 2014 the Beyond the Boroughs National Scholarship Fund and Chef Richard Ingraham partnered to host our second annual Healthy Eating Seminar at Food and Finance High School in Manhattan as a part of Beyond the Boroughs NFL Draft Week. Chef Ingraham taught a group of students that healthy eating is part of a star athlete’s lifestyle. Q&A followed with Tutan Reyes, Keith Bulluck, Carlos Emmons, Deon Grant, and Takeo Spikes. Chef Ingraham also conducted an interactive cooking demo. The students learned healthy cooking tips, recipes, and received the opportunity to meet current and former NFL stars.